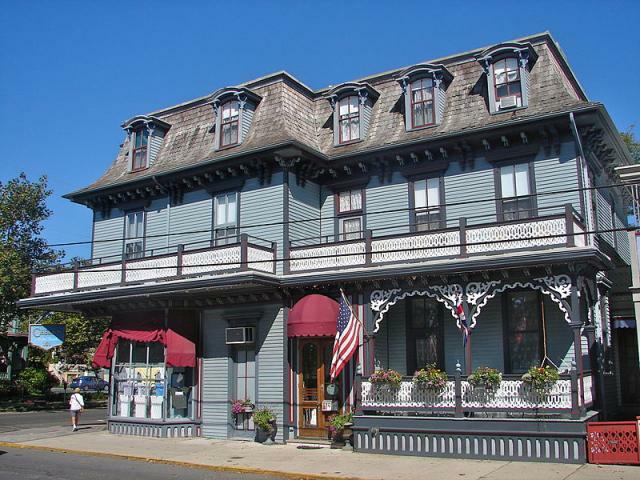 The Queen's Hotel, once known as the Heirloom Bed and Breakfast, sits on the corner of Columbia and Ocean in the heart of the historic part of Cape May, New Jersey, and like many of the old buildings in the area, it is said to be haunted. The large, three-story building was originally built to house Ware's Drug Store, and, after the fire of 1878, was repaired and soon after housed a number of different businesses. Among these was a 'house of ill repute' on the third floor. It is one of the workers from the third floor business who is said to still maintain a presence in the building today, as guests have noted that a strong perfume in the Plum Room on the third floor. From exploding commodes to vacuum cleaners that switch on and off by themselves, a number of odd occurrences have caused more than a few to have second thoughts about the Plum Room.